A solid all-round budget printer that does a surprising amount for the price. Great print quality mixed with ease of use, all in a tiny footprint. This printer is solely, entirely, unquestionably aimed at the budget home printer market. It's ridiculously cheap to buy for the functionality you get, and with excellent photo print quality it can suit both a homework or a home-photo style of use. 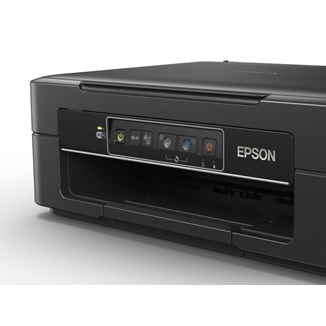 The XP-245 is part of the Epson small-in-one range, and the manufacturer keeps their printers nice and simple in this price bracket. They know users of home budget printers want simplicity with the ability to handle every day tasks, and that's what you get. You don't get anything else, most importantly it does not support Apple AirPrint so anyone after that take a look at the HP Deskjet 4520 instead. Otherwise, the most important thing to note is this printer really, really is part of the small-in-one range. If desk space is at a premium the XP-245 is ideal. 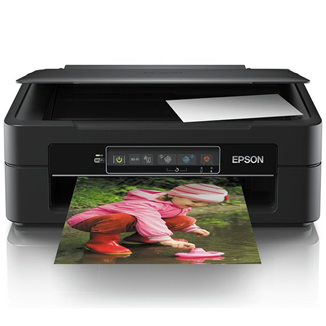 This Epson is very similar, almost identical, to any other budget Epson printer; it is not the fastest by any stretch of the imagination. You're looking at around 5 pages per minute print speed, and if you're after A4 photos they will take a few minutes to process and print. Ultimately though you can't complain; you're getting excellent quality in a printer that retails for around £40 in offer season. And the quality really is excellent. Obviously if you spend £100 on a brand new Canon best buy then your photos are going to look better, but the brightness you see on prints from the Epson XP-245 is very impressive. Glossy prints are bright and colourful, even skin tones come across pretty well considering the XP-245 only uses 4 cartridges. Day-to-day documents come out well also, with blacks registering well at smaller fonts. Quality is good enough for anything ranging from homework, normal documents like boarding passes, photos to display on the fridge; basically anything a home could need, and that's what this printer is all about. This printer takes the Epson Strawberry range of cartridges, also known as the Epson 29 range. This range has the four normal colours for a printer, black, cyan, magenta, yellow, which you replace individually as each runs out. 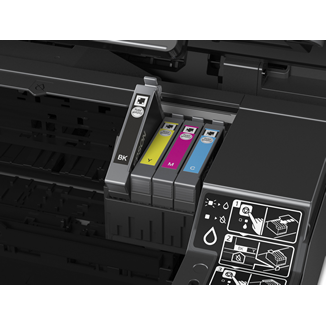 They come in two capacities; the standard capacity inks are up to 180 pages for each colour, the higher capacity XL cartridges has 2.5x the inks with up to 450 pages per colour. As is common with budget printers the running cost of the standard capacity inks are extortionate and should be avoided. Using the Epson originals you'd be looking at a cost per page over 5p which is very high. Stick to the XL's and your running costs will be around 3.5p per page which is fairly typical for budget printers, and won't run up too high a bill if you're a light user (which is who this printer is aimed at). You can enjoy huge cost savings by using our compatible inks instead, dropping your cost per page by 66% to around 1.3p per page. These costs will only come down as supply becomes more readily available, and is a great way to be able to print more without breaking the bank. Anyone who was considering our previous best buy, the Epson XP-235. It's spiritual successor, this budget home photo printer can handle anything you throw at it and, while not the cheapest, anyone with heavier home printing shouldn't be considering it anyway. Perfect for those who print infrequently. Suitable for homework? Yup. Photos for the fridge or frames? Definitely. A solid all-round budget printer.